The company is owned by Gunnar and Karin Bergstedt. Gunnar is a former national team and professional skier but then under the name Grassl. An international network of distributors and representatives that are active in over 30 countries. Owns and operates its own sewing factory in Poland with 70 employees. This also houses, other than sewing textile, printing capability for both screen and digital printing. The business is specialized, but not limited to, uniforms for alpine ski clubs, ski schools and lift facilities. Competition bibs and gate panels are another specialties. And it is also one of the leading manufacturers of alpine racing suits. We also perform some limited contract sewing for other brands. 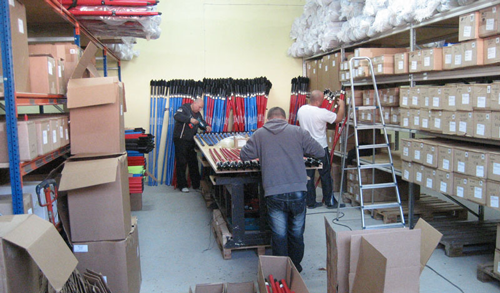 It also is the the main hub for the distribution of American Break-A-Way slalom poles, safety nets and accessories in Europe. Sales channels are obtained by customer visits, mail-order catalog, Web-shop, the outlet store, as well as international network of distributors and representatives.